Minnesota Vikings quarterback Kirk Cousins is sacked by Philadelphia Eagles defensive end Michael Bennett, who was called for roughing the passer on the play. 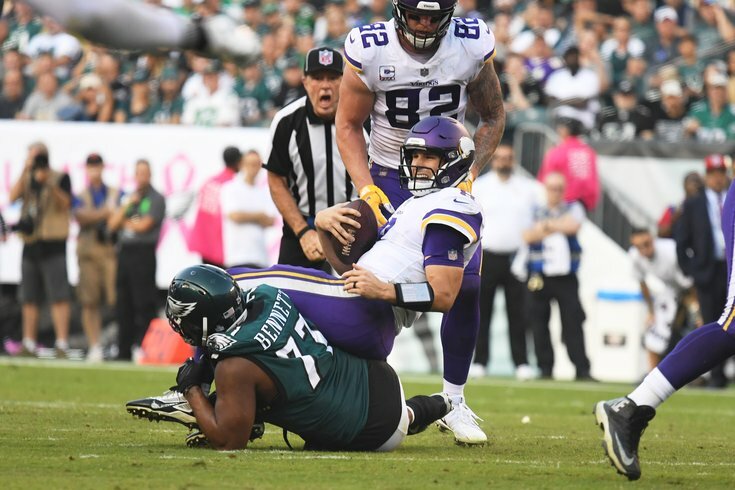 One of the most consequential plays in the Eagles' 23-21 loss to the Vikings Sunday, without a doubt, was Michael Bennett's roughing the passer call on a sack he had late in the second quarter. The Vikings were driving down the field and just on the cusp of field goal range with a one score lead. Instead of pinning them back and potentially forcing a punt, the 15-yard penalty gave the Vikings new life and an eventual touchdown pass from Kirk Cousins to Adam Thielen. "I don't know what he's supposed to do," a frustrated Malcolm Jenkins said after the loss. "When the quarterback has the ball, I know they don't want low hits on the quarterback but if you're falling down you're supposed to I guess let the quarterback go? The explanation from the official was he has to avoid that hit, which means he can't do his job. "That was frustrating, I don't know what to tell Mike to do." Referee Walt Coleman explained his the call after the game this way: "He want low into the quarterback's knees with his shoulder, with force. And the rule is that you cannot hit the quarterback low at the knee area or below with force. He got him there with his shoulder, so that's what I had as far as roughing the passer." Coleman also explained that the call was not due to the newly changed rules to protect quarterbacks created before the season. "That's not new roughing the passer," he added. "That's a classic. That one has been there for quite some time now." The Eagles, of course, as Jenkins would go on to admit, had several other opportunities to come back in the game, but the continuing trend of throwing these flags — making defenses either pay the price or play timidly — is making an impact on nearly all 32 teams this year. "Literally it means he has to fall and allow the quarterback to continue going down which is the antithesis of his job," Jenkins said. "We have to find a way to overcome it." "I think [the rules] just sometimes lack common sense," he continued, after being asked if the rule is too slanted against defenses. "I get it. They want to protect quarterbacks, I completely understand that they're the lifeblood of our game but its really hard to do our job and it's having an effect on some games." Watch the video. You decide.